The topic of this call was diving deeper into “Working with Resistance in International Development.” The call was facilitated by Gail Hochachka of Integral Without Borders. 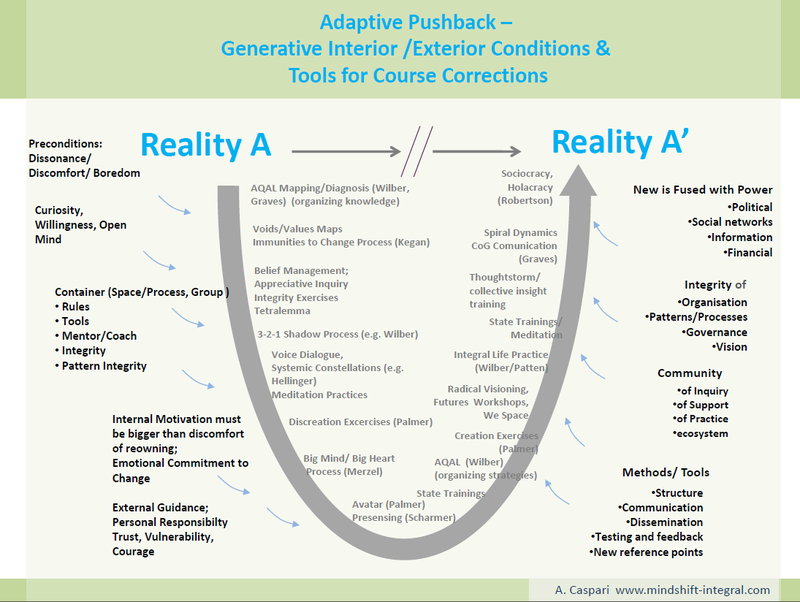 Ken Wilber and Anne Caspari discussed the deeper and finer issues of Theory U and transformative processes, that Anne had mapped out in her earlier work (Diagrams – working with resistance). We discussed the different phenomena of restistance and adaptive pushback that are usually surfacing as recognizable patterns in these processes and their relationship to stages of development, states of consciousness and the shadow. Then we went also to explore the difference between individual and group processes, a research on collective insighting with Bonnitta Roy and the Alderlore Insight Center, that Anne is also involved in. Since all of the participants, including Ken was really interested in this research at this ‘fresh edge of discovery’, we will keep you posted on the outcomes of that.